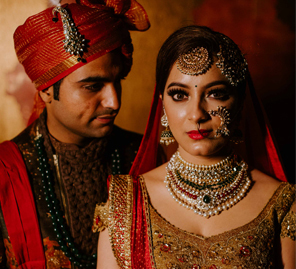 Traditional color palettes, glamorous wedding outfits and a subtle luxury marked Chitra and Pranay’s traditional Bengali wedding which was a royal affair. In the City of Joy, Chitra wed Pranay, the man of her dreams. The groom tells us all about their story and the highlights of their wedding. Haldi, also called ‘Gaye Holud’ is one of the most festive Bengali wedding ceremonies. The theme for this function was ‘monsoon’ and the elegant haldi décor, customized to the bride’s taste featured a traditional palette of yellow and blue. 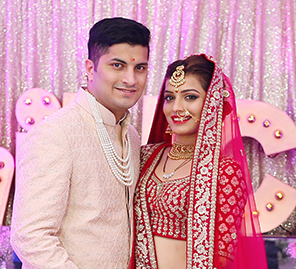 While all her bridesmaids were dressed in blue sarees, the bride looked ethereal in a yellow and gold lehenga paired with statement jewellery that added a royal charm. The mehndi was the most ‘happening’ party. The couple hosted their guests in an al-fresco, poolside venue where great music and gorgeous drinks enlivened the evening. The vibe was very chill as the couple wanted their guests to just relax and have fun. Everyone let their hair down as the DJ played foot-tapping music. The winter themed sangeet was inspired by Narnia’s winter wonderland. It was a gala affair made especially poignant with guests catching up with each other after a while and taking pictures with the beautiful décor as backdrop or at the quirky photo booth. There were also professional performers as well as energetic dance performances by the parents, friends and other family members that left everyone awestruck. The setting for their wedding was breathtaking. The color scheme for the decor was blush with a touch of gold and floral arrangements were a prominent part of the setup. 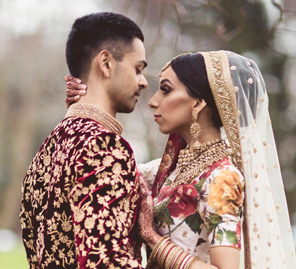 The couple exchanged their vows in a traditional Bengali ceremony. 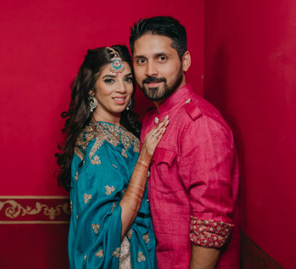 The bride wore a beautiful red and green creation by Sabyasachi. The groom wore an embroidered sherwani that complemented his bride’s ensemble. After the sophisticated ceremony, as evening fell, the couple, surrounded by their closest family and friends, walked into the next chapter of their lives.